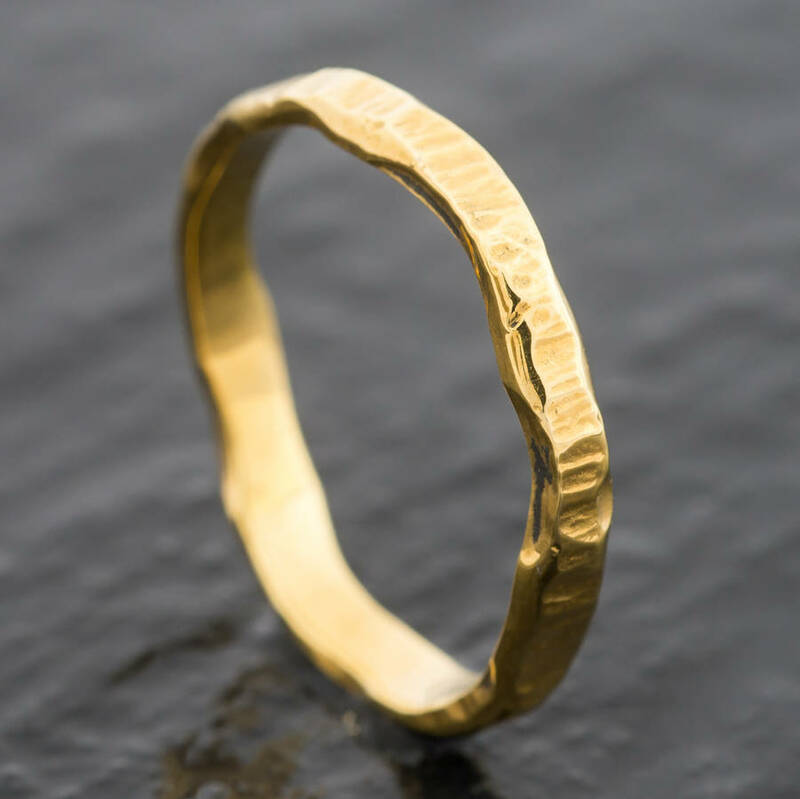 A rustic wedding band with a hammered bark finish. Incorporating natural English, Welsh, Scottish or Irish Gold. Jacqueline & Edward weddng rings are perfect for people who prefer ethically produced jewellery and would like something totally unique. 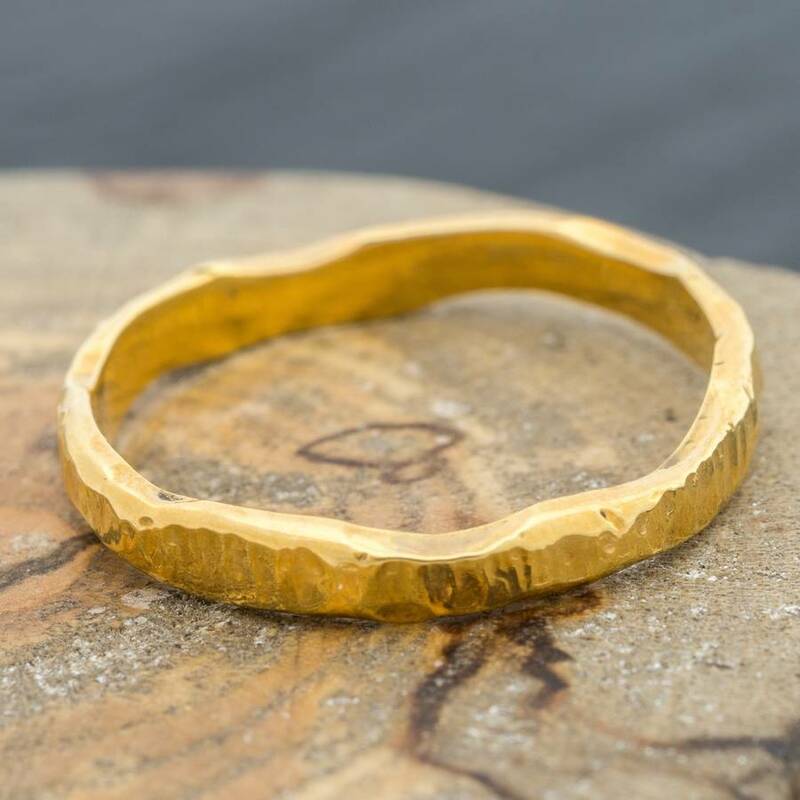 Added meaning is given to our pieces by fusing ethically sourced metals with gold and silver panned from around the United Kingdom in areas which often tie intimately into a couple's memories or history. Should you wish, some of the gold used within your wedding rings can be found by your own hand by joining one of our weekend gold panning adventure packages. This ring can also be made in rose gold, palladium, platinum or sterling silver. Please message me for alternative quotes. 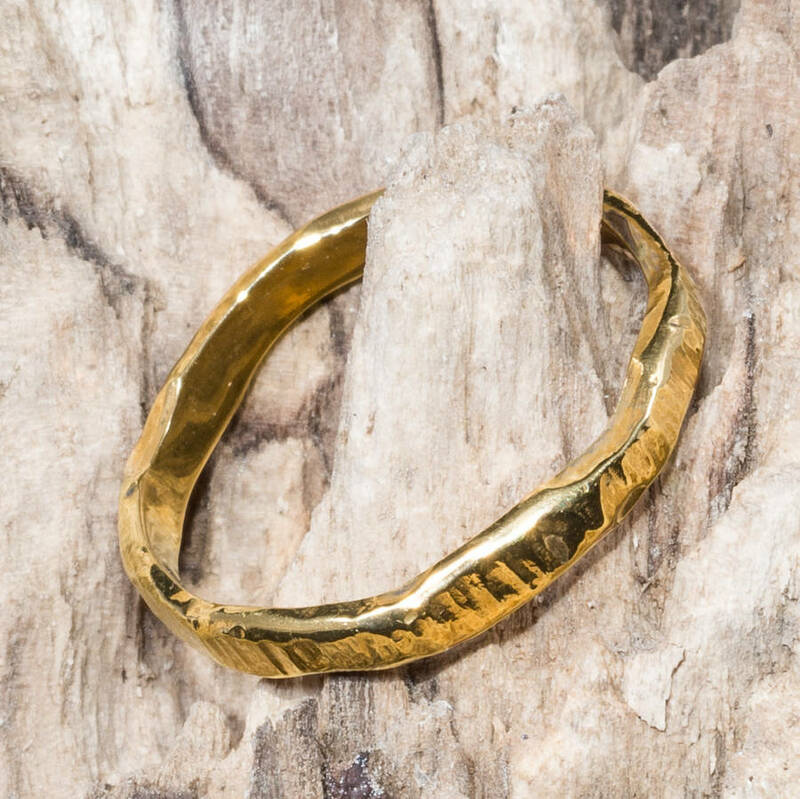 Our 18ct yellow or rose gold rings are made unique by fusing natural alluvial gold sustainably panned from rivers within the United Kingdom and 18ct Eco-gold. Gold is available from rivers all around the UK, so if a specific area has meaning to you and / or your loved one, then please get in touch to discuss whether gold is available from that region. Our silver rings are made by fusing natural alluvial silver panned from the rivers of Scotland with Eco-Silver and our palladium and platinum rings are made from recycled sources only. 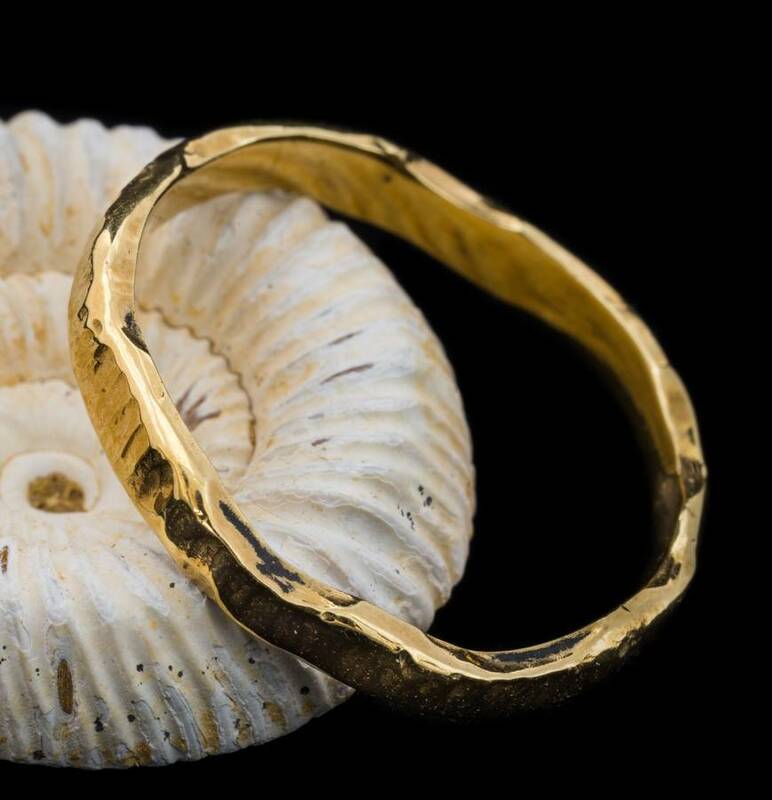 When a wedding ring pair is made of the same medium, then they are created from the same molton bead of gold so one ring is naturally a part of the other. Each ring or pair of wedding rings comes in a hand carved driftwood or relaimed wooden box. Gold and silver rings also come with a certificate of provenance. 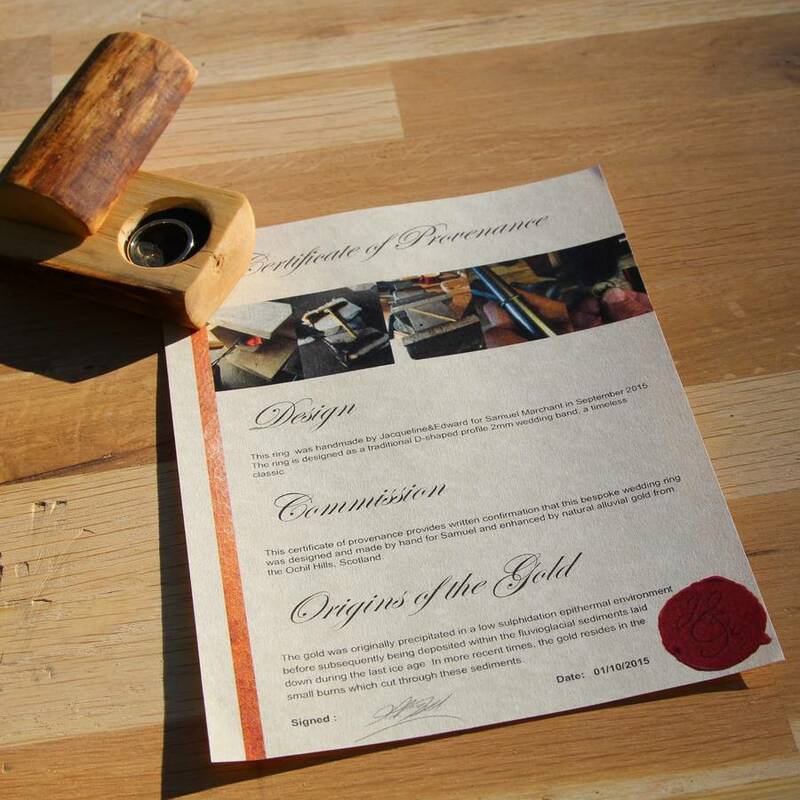 Each Jacqueline & Edward Certificate of Provenance is individually produced to authenticate your piece. The certificate contains a photographic record of the making of your ring, the story behind its design, confirmation of the origin of the alluvial gold or silver used and information relating to its geological origin. If you require a different metal, width or finish please don't hesitate in getting in touch to discuss this via the 'ask seller a question' button. This product is dispatched to you by Jacqueline & Edward.